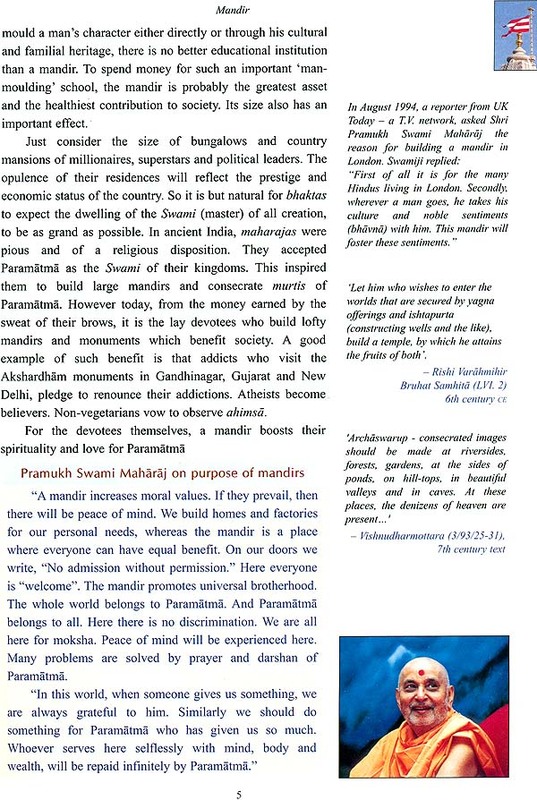 The Bochasanwasi Shri Akshar Purushottam Swaminarayan Sanstha (BAPS) is a global socio-spiritual organization committed to the moral and spiritual uplift of mankind. It was established in 1907 CE by Brahmaswarup Shastriji Maharaj in consonance with the Vedic teachings propagated by Bhagwan Swaminarayan (1781-1830 CE). The Sansth’s global network of 9,090 Satsang centres are perennial sources of moral, social cultural and spiritual activities. He energies of the BAPS volunteer corps of 55,000 youths and over 700 sadhus are channelised towards a variety of philanthropic activities. The BAPS is an NGO in Consultative Status with the Economic and Social Council of the United Nations. Its world renowned cultural and spiritual complexes like Akshardham in Gandhinagar and New Delhi and the Swaminarayan Mandirs in London, Nairobi, Houston, Chicago, Toronto and Atlanta, are some of its epoch-making contributions to society. Under the inspiration and guidance of Pramukh Swami Maharaj, BAPS has earned an endearing and unique place in the hearts of millions throughout the world. Acclaimed as a unique and rare holy soul of India, Pramukh Swami Maharaj was born on 7 December 1921, in the village of Chansad, Gujarat. He is the fifth successor in the illustrious spiritual tradition of Bhagwan Swaminarayan and the embodiment of the universal Hindu ideals. In his presence doubts dissolve, confusions clear, hurts heal and the mind finds peace. His selfless love and morality equally soothes and moralises children, youths and the aged; regardless of caste, creed or status. Out of his compassion for humanity, he has visited over 15,500 villages, towns and cities, sanctified over 267,000 homes, and read and replied to over 700,000 letters. He has ushered a cultural, moral and spiritual renaissance in India and abroad by establishing over 700 mandirs. His divine humanism has provided succour to countless souls in time of natural catastrophe and need. His striking humility, simplicity and spiritualism have impressed many religious and national leaders. Above all, his profound experience and realisation of God is the essence of his success and divine lustre. 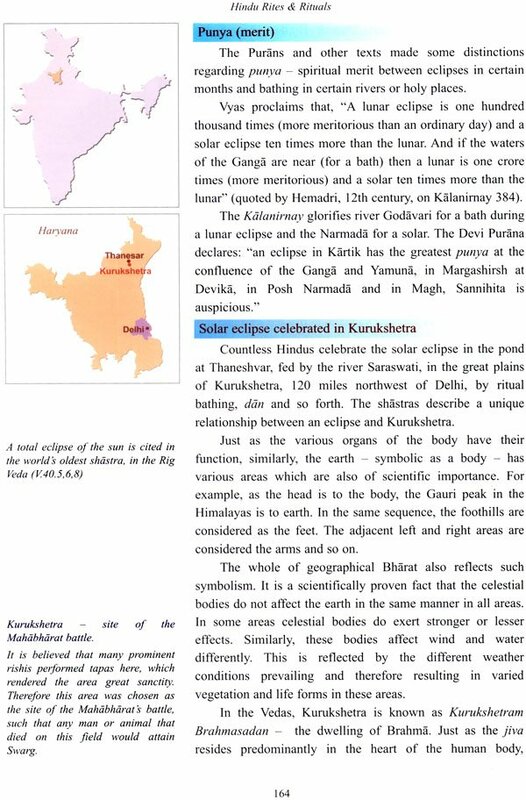 Is the author’s fourth full-colour book in the cadre of “eventually growing category of a ‘Hindu Dharma Encyclopaedia” cited by Dr. Hasu Yajnik in his Foreword to Hindu Festivals (origin, sentiments & rituals), the author’s previous previous book (2005). 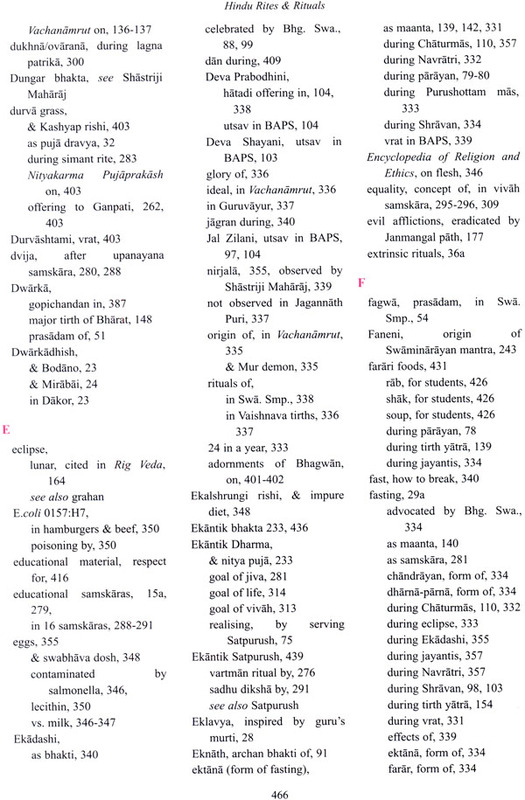 The first was Vachanamrut Handbook and the second, Rishis, Mystics & Heroes of India (Vol. I). This book break’s the record with an astonishing number of 781 superb colour photographs, 90 paintings and 27 maps. These enable the reader to experience the depth and understanding of how Hindus live and have adjusted to migration, changing cultural trends and cope with daily stress by their rites, daily rituals and festivals. 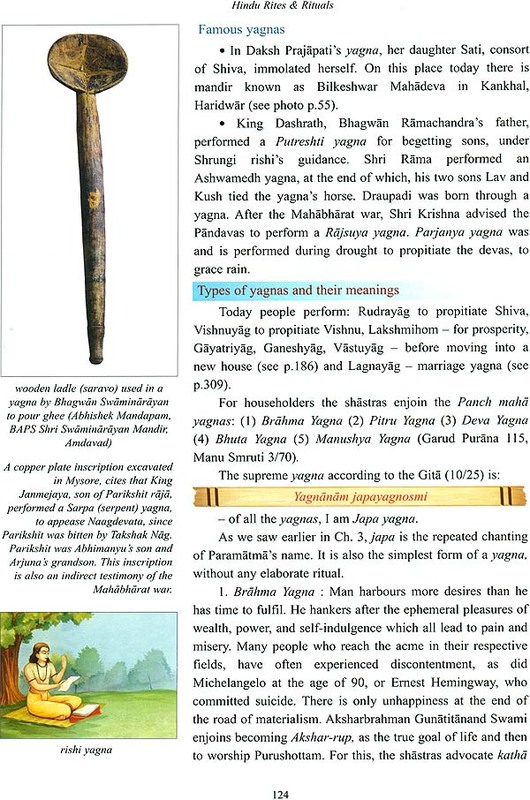 The effort and care to include the minutest details and references from the ancient Sanskrit shastras is commendable. There’s something here for every reader; all young Hindus who have been pestering parents about the ‘why’, their parents who sorely wished they had the right answers, as well as for teachers, admirers and academics. A book worthy as a birthday gift and for young Hindus about to get married. The brief explanation of the vivah rites with photographs will make the ceremony all the more meaningful and increase its sanctity in the hearts of the Hindu couple. A must read prior to marriage. The answers to these and other doubts do exist, in Sanskrit texts. However few people today know Sanskrit. Even less have time to search through translations. Lack of answers lead them to lose faith in practicing rituals and religion generally. The power of science, T.V. and electronic media also add fuel to the fire and often ridicule Hindu practices. This book aims to provide answers and cogent arguments for all Hindus seeking answers to questions that may have irked them. It can be a vital tool for Hindu parents to inform their children about Hindu rituals. 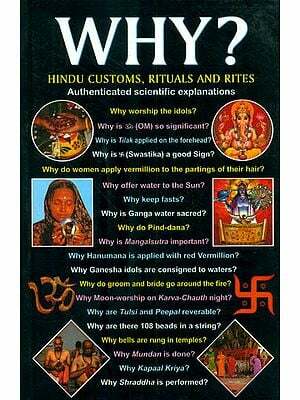 Yet this book also reaches out to young Hindus themselves, who can learn the reasons underlying rituals. They will then be able to explain to their friends, without shying, that Hinduism is more than just yoga and mysticism, and can be practiced in today’s hi-tech life. Similar to a previous book, Hindu Festivals - Origin, Sentiments & Rituals, (2005), this book has attempted to capture the authenticity, essence, colourful charm and rich variety of Hindu rituals. Moreover, the inclusion of fifteen new chapters with a photographical account, hopes to provide a new, festive dimension to rituals, which should be an enthralling and enlightening experience. The answers and scientific elaboration about the significance of rituals hopes to remove any stigma and doubt usually associate with Hindu rituals; of them being old fashioned, rote and impractical in modern life. 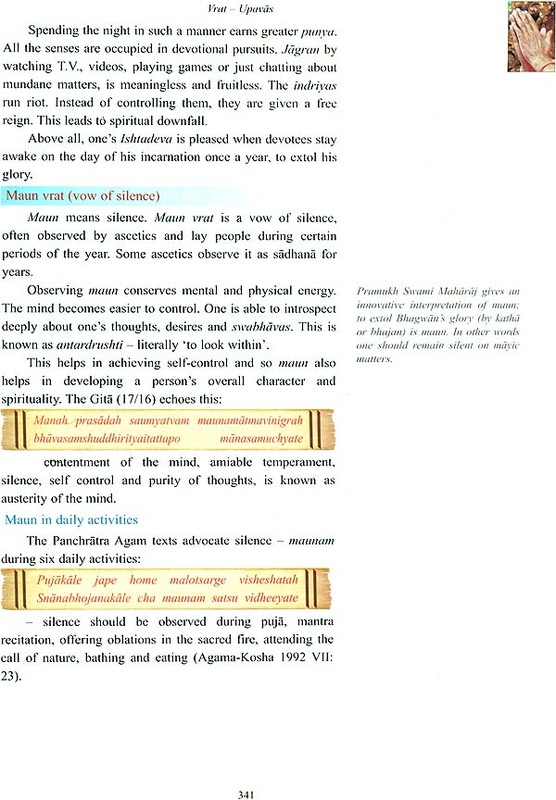 It may surprise young Hindus to know that several rituals discussed in this book such as mansi puja, meditation and pranayama, can improve their overall physical health, immunity, power of concentration, memory, creativity and performance in sports, in addition to the spiritual gains. This is because they activate right-brain function, which deals with the above factors. The same rituals induce zest for living, since they directly focus on Bhagwan, who is the fountainhead of divinity, as well as the inspirer of the atma residing within. Practicing Hindu rituals will also help them identify and connect with a cultural tradition which is over 10,000 years old. It will boost their self-esteem and pride in being Hindus. 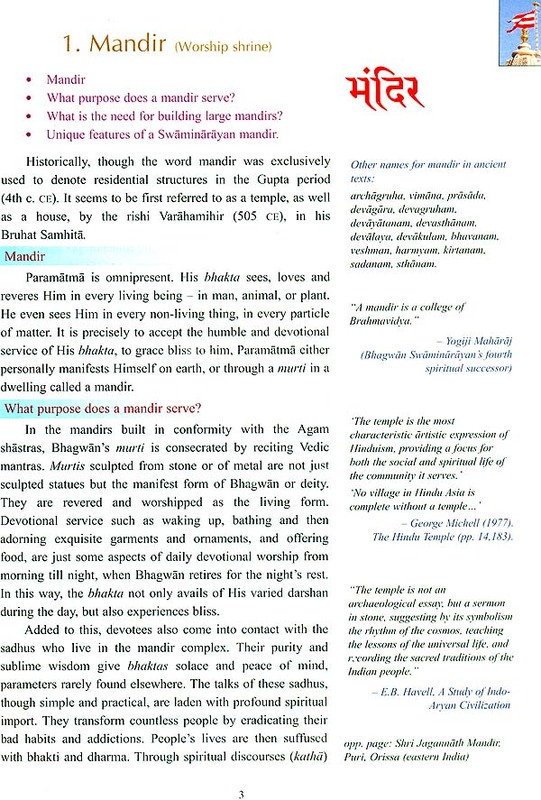 Besides the rituals of the Swaminarayan sampraday, which are based on Vaishnavism, this book incorporates similar religious rituals practiced in the important Vaishnav and Shaiva traditions and mandirs of India. Today with finger-tip access to the internet, young Hindus often come across a wealth of information about Hindu rites and customs that are a common feature of Sanatan Dharma. However they are then stumped about its accuracy and context. Often the accounts are interpretations of a particular website, whose answers are based on its own philosophical tradition, which may conflict with the surfer’s own tradition and beliefs. On such occasions, surfers need an easily readable book, which quotes the sources of the rituals from the original shastras and explains the variations of its practice in other beliefs and regions. important sacred symbols related to rituals. In these five sections, readers can glimpse into the vast and mystical phenomenon of rituals, practised by a billion Hindus worldwide. 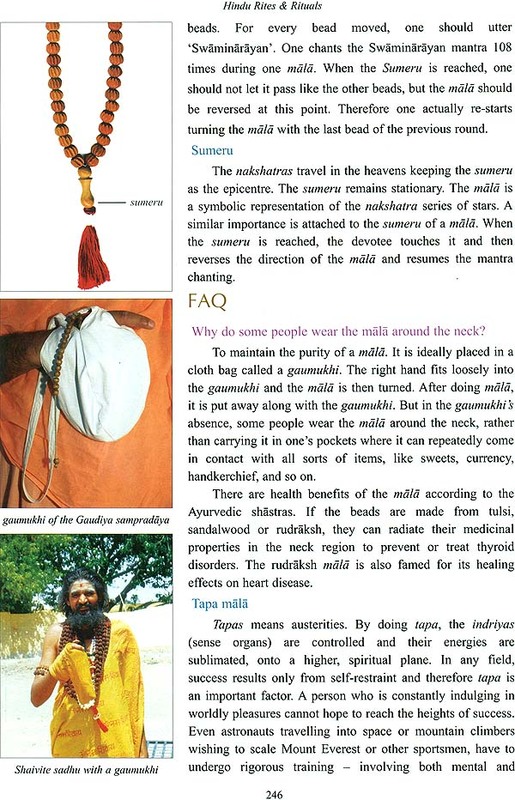 They can appreciate the underlying scientific approach of the rishis who gifted these rituals to mankind. 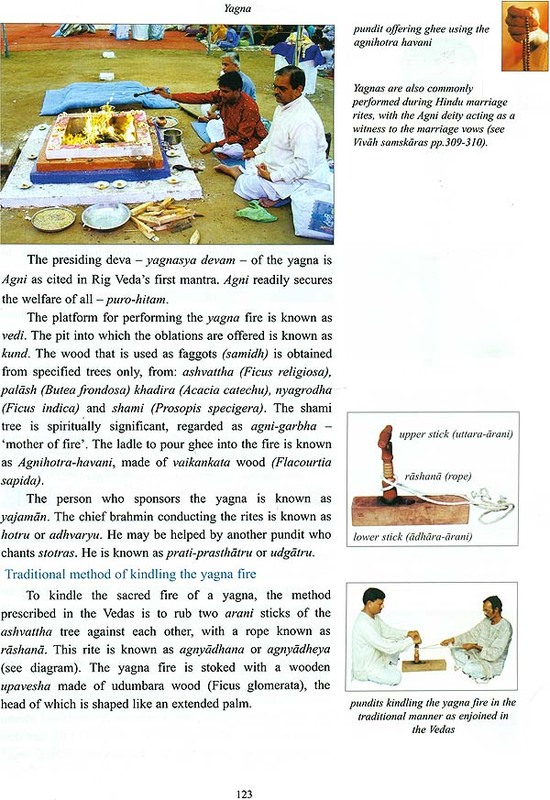 Young Hindus especially, can glean the answers to frequently asked questions (FAQs) regarding Sanatan Dharma’s varied religious beliefs and practices. Why should one practice rites and rituals? Why should one perform morning puja? How does a Hindu pray? Are prayers answered? 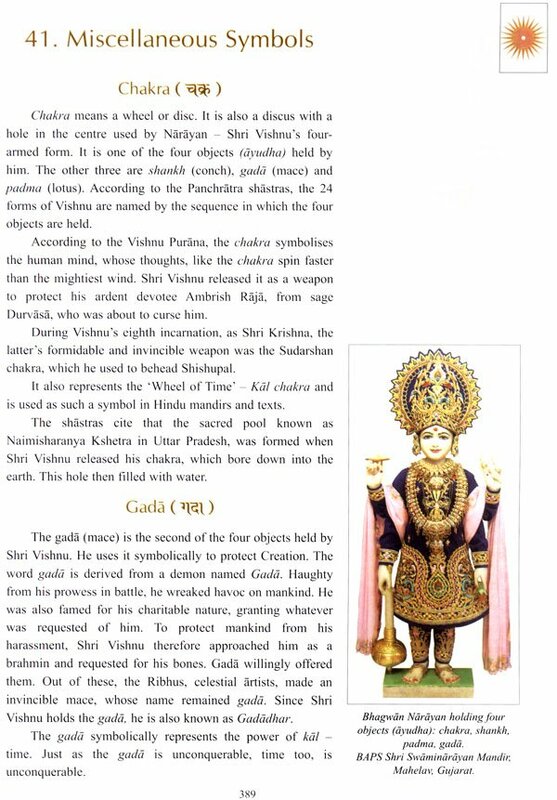 How is a murti different from a statue? 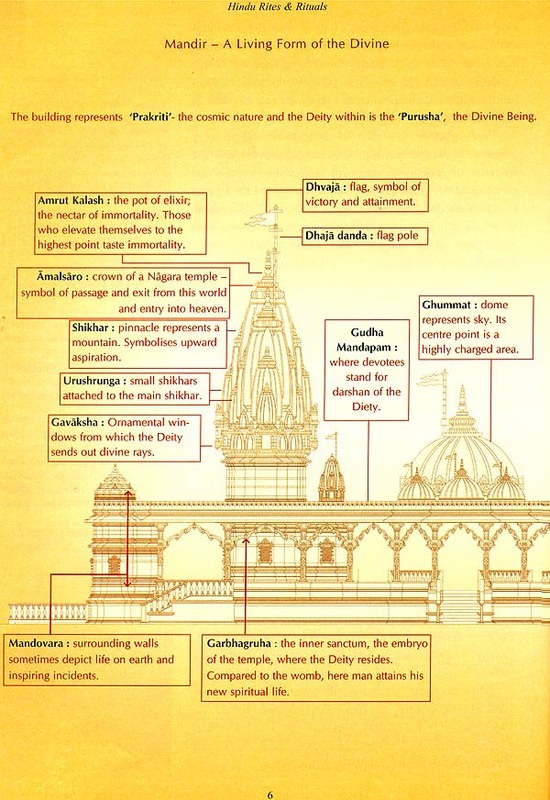 Why do people ring a bell on entering a mandir? 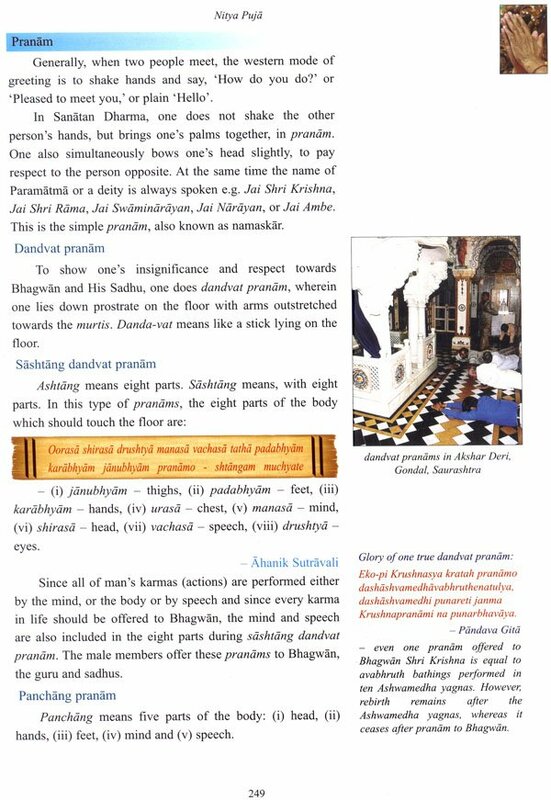 Why do Hindus join their palms in pranams instead of shaking hands? Why should one offer pranams to parents every morning? Why should one have a spiritual guru? 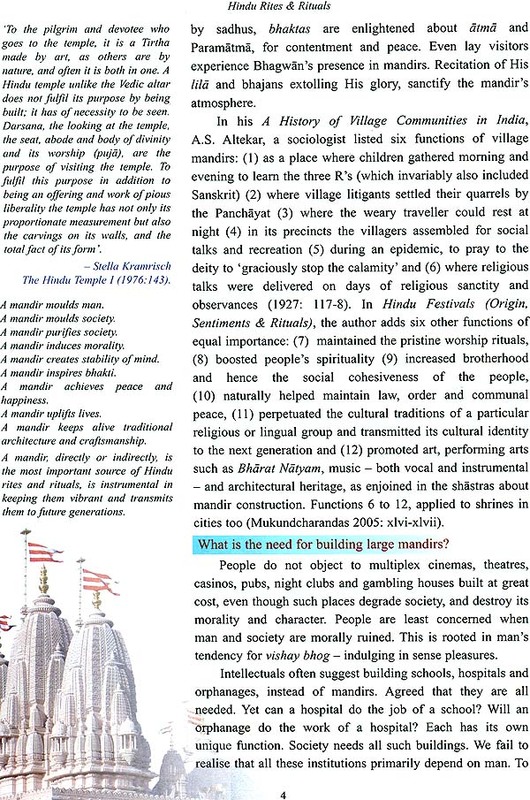 How does a tirth arise? What is the significance of serving others (seva)? Why should one have a home shrine? What is the significance of performing puja(n) of a newly purchased house, business or object such as a fridge, car, etc.? What is bhakti (devotion)? Can stress be relieved by chanting mantras? What is the purpose of clapping when singing bhajans? Is it yog or Yoga? What is the importance of celebrating festivals? Why is fasting, rather than feasting, observed during certain sacred days and jayantis (anniversaries) of avatars? Of all rituals of sadhana, which pleases Bhagwan the most? Why is marriage regarded as a sacred sacrament? What is so significant about avoiding pre-marital relationships? 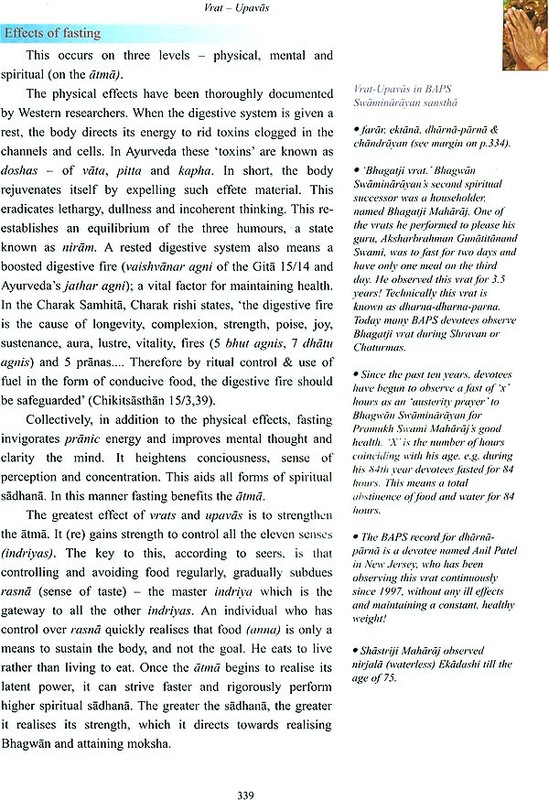 Why is vegetarianism an important Hindu diet norm? Why are certain plants, trees, animals and objects considered sacred or auspicious? Answers to these and other questions appear in this book. It would be favourable to begin the book from chapter 1. However in eagerness to seek an answer, the reader may choose to dive in at any other part, without feeling a break in sequence, since each part is conclusive and not textually continuous with the next part. To find an answer speedily, refer to a key word in the Index. Every culture in the world has its own customs, rites and rituals relating to marriage, diet, prayer, meditation, atonement, pilgrimage and so forth. Sanatan Dharma's rishis, seers and shastras formulated rituals and rites which helped mankind to live in harmony with nature and with others. 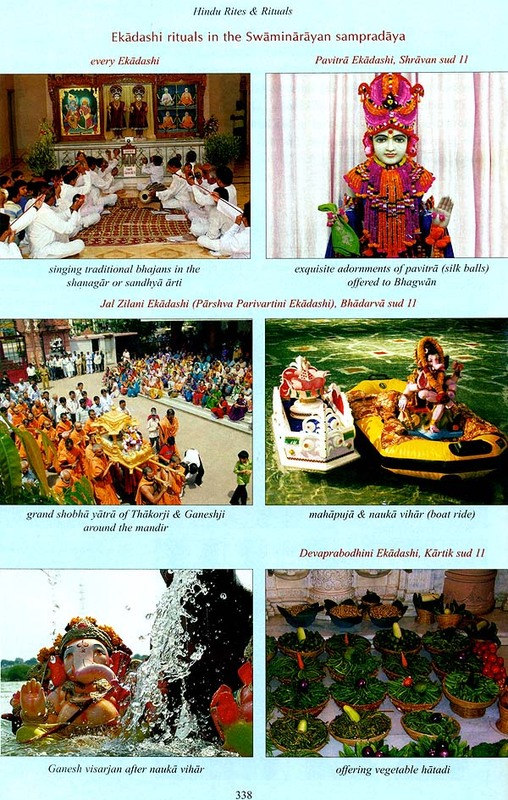 Ultimately these rituals aimed to elevate man spiritually, to realise the Supreme Reality. The rituals and rites dealt with in this book incorporate references from the Vedas, Purans, Panchratra shastras - classed as shastras of bhakti, jnan, kriya, charya and yog - the Dharma shastras (treatises of law), which deal with codes of conduct, such as the smrutis of Manu, Yagnavalkya and other rishis, Ramayan, Mahabharat, the Gita and shastras of the Swaminarayan sarnpradaya. Understanding the rituals and rites of a culture, and their underlying sentiments and mode of practice in daily living, deepens respect and tolerance and helps man co-exist in harmony and brotherhood. For Hindus, especially the younger generation, understanding rituals makes them more meaningful, helps clarify misconceptions, increases respect for Sanatan Dharma and inspires them to imbibe these rituals in their own lives. It also increases their pride in belonging to the most ancient tradition in the world. It even helps them to tolerate insults. 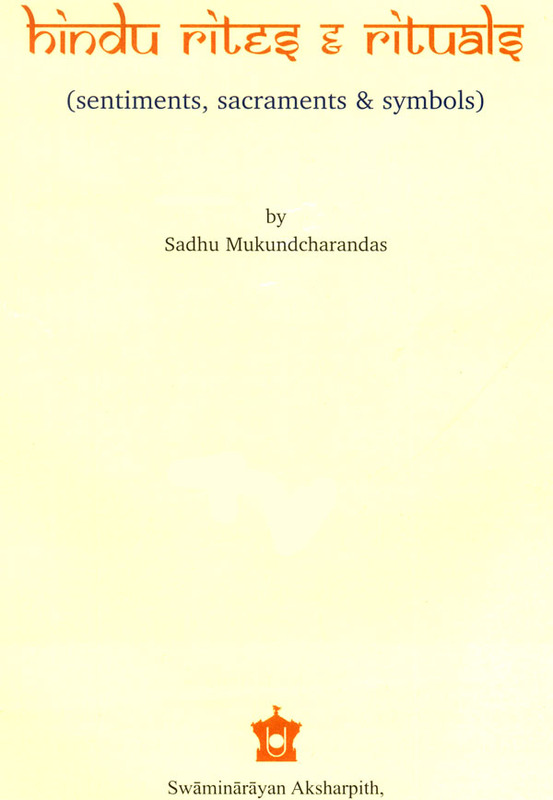 Hindus who are not given samskaras (nurture) by parents from early childhood, tend to develop an inferiority complex and cultural identity crisis when confronted with issues raised at school by peers and even teachers. Ignorant of their lofty cultural roots, such young Hindus reject their Indian identity and mimic peers (Warner 1998:62). For instance, they will readily practice rituals in other forms such as the gesture of bowing, similar to prandms, to their martial arts instructor, yet disdain and feel uncomfortable in offering pranams to parents, other family elders, sadhus and even deities! Hindu rites and rituals instil, invigorate and perpetuate cultural and spiritual traditions; factors which are beginning to lose their importance in today's hi-tech, materialistic and fast-paced lifestyles. Practiced from childhood, Hindu rituals empower the young and their parents with spiritual fortitude, since ritual acts as a medium to connect with the Divine and to earn His grace and blessings. With such spiritual fortitude, an individual is better able to cope with daily life's toughest stressors. Even more potent and the root of all discord, are the internal stressors, the swabhavas - base instincts - such as ego, anger, lust, avarice, greed, hate and others. With the help of rituals such as satsang* and katha - listening to the shastras' discourses and Bhagwan's glory - the turmoil within, caused by swabhdvas can be calmed and eradicated. 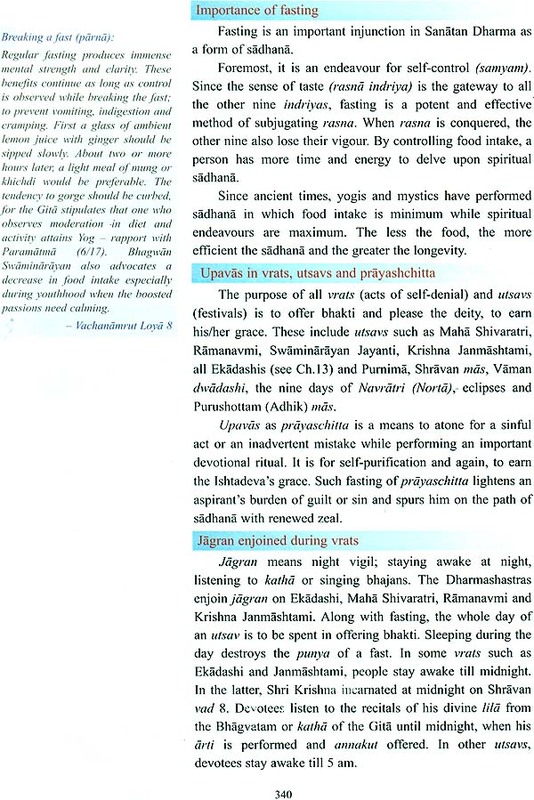 From a historical perspective, the practice of rituals of vidhi and nishedh - the do's and don'ts respectively - had been negated and falsified by later followers of Shankaracharya (778-810 CE), known as pseudo- Vedantis. 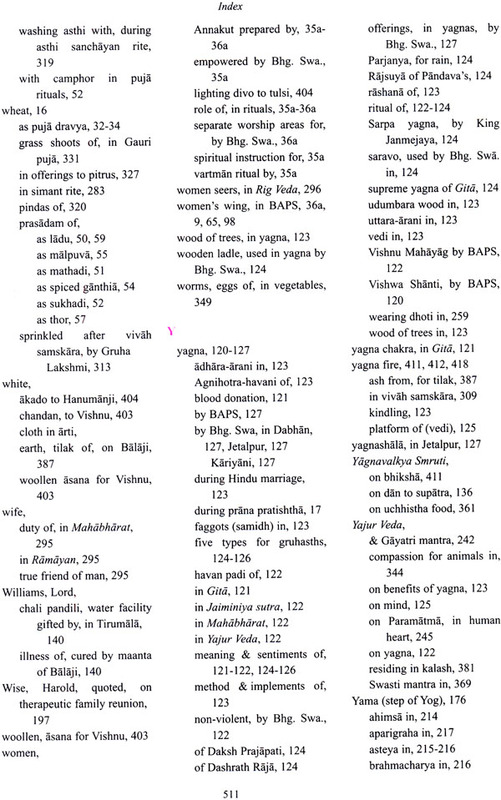 In 1820, Bhagwan Swaminarayan commented upon this in Vachanamrut Gadhada 1-42. 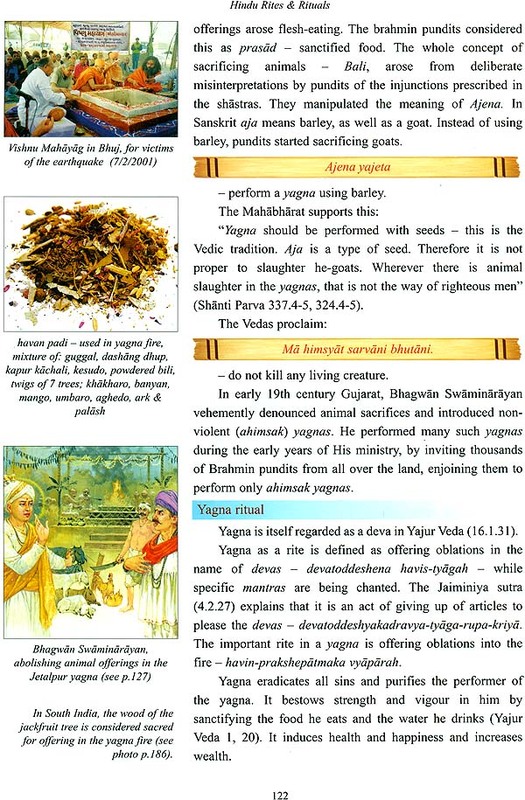 He explained that such Vedantis regarded the moral do's and dont's as false, as well as heaven and hell, which are attained by observing vidhi-nishedh, They claimed that, the disciples and the guru, who attain heaven or hell are also false. Only Brahman is satya (truth) - brahmasatyam jaganmithya. He elaborated that Shankar, who was the acharya of all Vedantis, enjoined his disciples to recite the Gita and Vishnusahastranam; to bow to those older than oneself, to beg alms and so propounded vidhi-nishedh (Charpatpanjarikastotra-13, Yatidharmanirnay- p.241, Samnyasdharmapaddhati- p.33,34). He further composed the Bhaj Govindam stotras of the Charpatpanjari praising Vishnu, and bhajans glorifying Shiva, Ganapati, Surya and other deities, precisely because he feared that an atheistic tendency would creep into people's hearts. 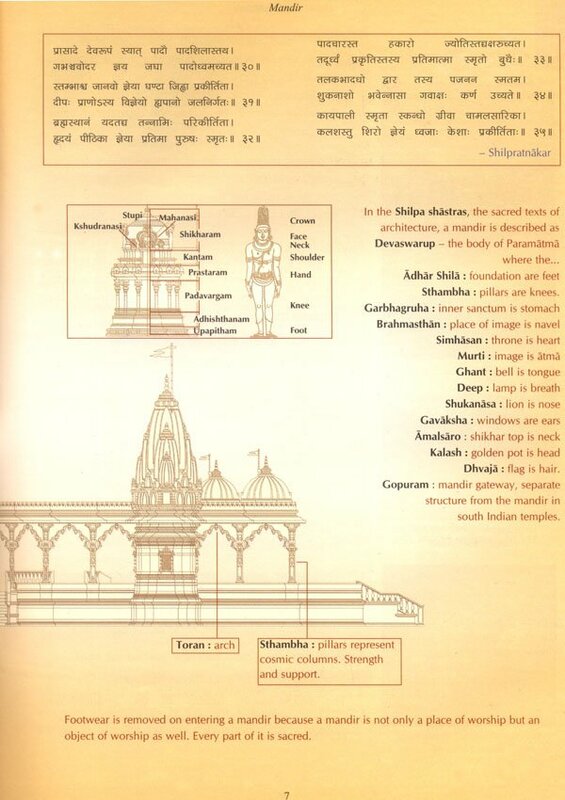 Therefore Bhagwan Swaminarayan declared that no matter how knowledgeable a person is, or the state of his spiritual realisation, he is still obligated to observe the rituals of vidhi and nishedh advocated by the shastras. The first generation Indian migrants to all parts of the world, practiced rituals out of faith in the wisdom of the ancient seers who enjoined these rituals. However subsequent generations were less inclined to practice by faith. They needed coaxing and convincing with scientific reasoning. In the past two decades, medical researchers have discovered the benefits of Hindu rituals and certain disciplines, at least on the body and mind. Though the rishis may not always have divulged reasons for the rites and rituals, scientific evidence is beginning to support them. In the early I950s, a French researcher, Alfred Tomatis M.D., declared that the foetus was capable of hearing. This supports the Hindu belief that nurture (samskaras) occurs during life in the womb. The story of Prahlad, who heard Bhagwan Vishnu's glory while in his mother's womb, listening to sage arad talking to his mother is well-known. Arjuna's son, Abhimanyu, while in Subhadra's womb, learnt the secret of penetrating six of the seven battle formations (kothas)' of the Kaurav camp, by listening to Shri Krishna talking to Subhadra. The benefits of Patanjali rishi's Yog postures is well known to a billion people practicing worldwide. Similarly, researchers have also investigated the effects of meditation and chanting mantras. They report that these induce a blissful calming in the body, which they have measured scientifically. One meditation technique, Transcendental Meditation (TM), is the most widely practiced and researched, with over three million people having learnt it. Dr. Vernon Barnes of the University of Georgia has reported that long term practitioners of TM have significantly lower blood pressure. A team of researchers in India researched the effect of chanting mantras. At the Vivekananda Kendra Yoga Research Foundation in Bangalore, scientists reported that chanting OM mentally, achieved a significant reduction in heart rate, which led to a deep form of relaxation, with increased alertness (Telles 1995: 418-420). In 1998, the same team also reported that chanting a meaningful syllable such as OM, caused a decrease in heart and breath rate, compared to a neutral syllable such as ONE, which did not produce a similar effect (Telles 1998: 57-63). Researchers also contend that rituals, whether in humans or animals, serve an important purpose of reducing acts of aggression between group members. Moreover, they create a strong social bond between individuals of the group. Anthropologists also note that rhythm and repetition are common in almost all human rituals, from chanting hymns to tribal fertility dances. The elements of rhythm and repetition of rituals help an individual to belong to a larger group or cause. In their book, Why God Won't Go Away, the medical researchers, Drs. Newberg and D' Aquili, posit that secular rites promote social cohesion by encouraging individuals to set aside personal interests to commit themselves for the common good. They further contend that the aim of ritual is to transcend the self and blend it into some larger reality, for example, to unite worshippers spiritually with a higher sense of reality (2001:80-81). Other researchers report that drum rhythms, repetitive muscle tensing and relaxing, and contributing factors such as fasting, hyperventilation (increased breathing rate) and inhalation of incense fragrances, all affect the brain, to produce emotional responses and intensely pleasurable, ineffable experiences. Along with these rituals, if a meaningful word is used such as a mantra, then this induces an even greater effect (Telles, et.al. 1998:57-63). Combining rhythm and meaning makes a ritual more powerful. A Hindu ritual that incorporates all the above factors, is arti. It includes drums, bells, conch, incense, visually attractive stimuli such as the exquisitely adorned murtis of deities, and singing the appropriate lyrics. This ritual of waving lighted wicks - known as diva (Hindi - diya) - in front of the deities, is the most endearing to Hindus. Singing the accompanying and meaningful lyrics of invocation and supplication, has an intensely transcendent effect in followers. Researchers describe this as 'religious awe' (Newberg 2001:89). Many non-Hindu visitors to new Vedic shikharbaddh mandirs in London, Houston and Chicago experience this. Schoolchildren in England visiting the London mandir have written back to thank the mandir 's volunteers and divulged that the arti tRajbhog drti at 11: 15 am.) was the most delightful and memorable moment of their visit. Why are Bhagwan’s charanarvind venerated so highly?